GAS Entec, a Korea­ based engineering and design firm dedicated to small and mid­scale LNG applications, introduced a new concept of floatable legged platform (FLP), which does not need to keep out of the way even in severe weather situations by anchoring the existing floating storage and regasification unit (FSRU) to the sea floor, at this year’s Gastech 2017. 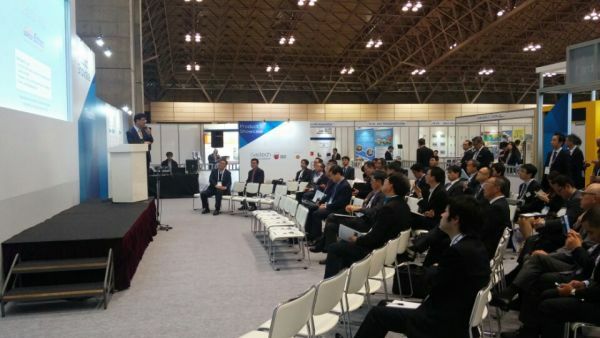 In a technology conference that was held on April 6, Choi Sung­Rak, President of GAS Entec, said, "This platform performs a role as the existing FSRU with LNG storage tank and vaporization facility installed in its upper side. The platform also minimizes the cost of docking and mooring assets because it needs no docking facility which is for mooring FSRU and is capable of mooring LNG carrier to FLP. Moreover, the platform saves operating equipment and manpower because it does not need to keep out of the way." The FLP is also capable of having power generating facilities like gas turbine, acting a role as a power generating plant that is capable of dealing with storage, vaporization and power generation in one platform. The platform in which both Korean and non­Korean LNG business operators have been interested even before release is a highly anticipated near shore solution for island nations in Southeast Asia, which are studded with small­ and mid­sized shipyards, and Central and South America regions where careful preparation for the typhoon is essential. After one­year development jointly with experts of the Korea Port Engineering Corporation (KORPEC) and a research team in the School of Naval Architecture & Ocean Engineering at the Ulsan University, the safety of the platform has been proven through wave force tests conducted by the Korea Institute of Ocean Science & Technology (KIOST), as well as frictional force tests conducted by Kangnam Corporation. As for the platform, a Korean patent is granted and applying for international patent is an ongoing process. Also, application for approval in principle (AIP) has been requested to DNV­ GL. The platform is fixed by being sunken under sea bed that is constructed by filling the lower part of its structure with ballast water.